Can a house with plastic components be considered green? Is this window green? Vinyl windows have captured the lion's share of the residential window market, outselling windows with wood, aluminum, or fiberglass frames. Vinyl-framed windows now outsell windows with wooden frames, aluminum frames, or fiberglass frames. Moreover, in many areas of the country, vinyl siding outsells all other types of residential cladding, and PVC is by far the most common material used to manufacture residential drain pipes. While these facts probably distress anti-vinyl crusaders, they provide evidence that these vinyl building products outperform competing products in some ways. Vinyl building products fill a niche. Vinyl is durable, weather-resistant, low-maintenance, and affordable. The raw materials used to manufacture vinyl — chlorine and fossil fuels — are associated with environmental problems. Some of the chemicals present in vinyl as a contaminant — especially dioxin — raise environmental concerns. Workers in plants that manufacture PVC resin face health risks. Some vinyl products include plasticizers that may be released into indoor air, potentially damaging occupants’ health. When vinyl building products wear out, they aren’t always disposed of in an environmentally appropriate way. 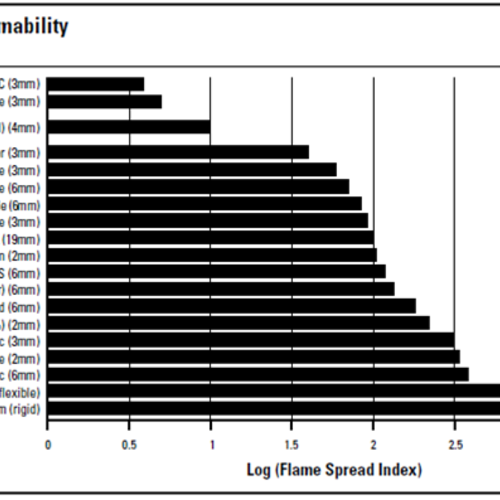 When buildings catch fire, vinyl building products release toxic smoke, endangering firefighters. A life-cycle assessment of vinyl’s environmental impacts may indicate that vinyl is less desirable than some alternatives. Should We Phase Out PVC? All of the above arguments have been used by anti-vinyl groups. Some of the points are indisputable, while others are debatable. On some points, evidence points to an opposite conclusion than the one reached by anti-vinyl crusaders. On other points, the evidence is inconclusive, and more research is needed before we can reach firm conclusions. For a good background on the issues surrounding the PVC debate, I recommend an Environmental Building News article written in 1994 by Nadav Malin and Alex Wilson, Should We Phase Out PVC? Environmental life-cycle assessments attempt to weigh all of the pluses and minuses of building materials so that one product can be compared to another. It’s important to remember than any life-cycle assessment is only partially scientific, and involves more judgment than calculation. Although there are valid reasons for concerns over the health of workers in plants that manufacture PVC resin, it’s important to note that workers’ exposure to dangerous emissions in these plants have dropped in recent decades. Builders who prefer wood windows to vinyl windows need to acknowledge an important truth: you can’t have wood windows without logging, and logging is a dangerous profession — more dangerous than working in a chemical plant. I have friends and neighbors who work as loggers; one lost an eye in a logging accident, while another still limps from a serious leg injury. Needless to say, I’m not advocating that green builders specify vinyl windows to reduce injuries to loggers. (The loggers I know enjoy their work, and don’t want to see their industry shrink.) I’m just pointing out the fact that workers in many industries face risks. A list of the ten deadliest jobs in the U.S. — a list based on government data — puts logging at #2 and roofing at #5. 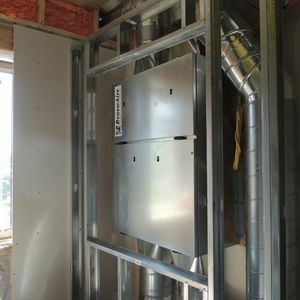 When builders and home buyers try to weigh the environmental pluses and minuses of different building materials, they often reach conclusions based on intuition rather than logic. But intuition can lead us astray. For example, how many builders know that fiber-cement siding requires more energy and water to manufacture than vinyl siding? Many elements of the anti-vinyl argument are emotional and inconsistent. Those who aim to build a plastic-free home rarely argue in favor of plastic-free computers or plastic-free cell phones. Similarly, very few people who are injured or sick insist on treatment in a plastic-free hospital — and considering the dependence of modern surgery and patient care on plastic materials, that’s a very good thing. Anyone who gets excited by the thought of owning a Prius needs to acknowledge that plastic materials are often extremely useful. According to one source, more than 50% of a typical vehicle’s volume is composed of plastics. Only a small percentage of homeowners really want a plastic-free house. Most who do will end up compromising, since it’s hard to wire a house without vinyl-insulated electrical cable. If a few Luddites manage to build a plastic-free house, it’s likely to resemble homes built 150 years ago. It’s an achievable but impractical goal. So, does it really matter if your window frame is made of vinyl or something else? Perhaps. If you hate the idea of having any vinyl in your house, it obviously matters. If you can afford alternative materials, you should specify exactly what you want. When it comes to an environmental analysis, however, the bottom line on vinyl is uncertain. All materials, including wood and even recycled materials, carry an environmental cost. Workers in most industries associated with the manufacture of building materials and construction face a risk of job-related injuries or death. This problem is not restricted to workers in plants that manufacture PVC resin. It may make more sense to use fossil fuels to manufacture plastics than it does to burn fossil fuels in our car engines. Vinyl products are ubiquitous. While it makes sense to manufacture plastics in ways that minimize environmental impacts and to lower exposure to dangerous chemicals in the workplace, it’s important to emphasize that plastics are now essential for the manufacture of cars, airplanes, electronic devices, and medical equipment. Most Americans buy all kinds of vinyl-containing products — including pens, potato peelers, and beach toys — without a second thought. The biggest environmental impact associated with a home is the energy required to operate the building, not the impacts associated with material choices. If you want to minimize the environmental impact of a construction project, the best thing you can do is not to build a new building. If you insist on building a new building, make sure that it is as small as possible, and that it is built with energy efficiency in mind. Almost any type of flooring is a better choice than vinyl flooring. Many of us fret about the environmental effects of our daily decisions, but we tend to focus on issues that don’t matter very much. Meanwhile, we manage to get the big things wrong. We may fret over whether we have properly separated recyclables from our trash, or fret over whether to choose a plastic bag or a paper bag when we go shopping. We may admonish family members who leave the water running while brushing their teeth. And when we build a new home, we wonder whether wood windows make more sense than vinyl windows. But the biggest environmental impacts made by American families concern our profligate use of energy and our voracious appetite for raw and manufactured materials. The best thing we can do to lower our environmental impact is to stop shopping. Instead of wondering whether you should buy vinyl siding or fiber-cement siding, you might consider whether there is any way to live in an old apartment building rather than to build a new house. 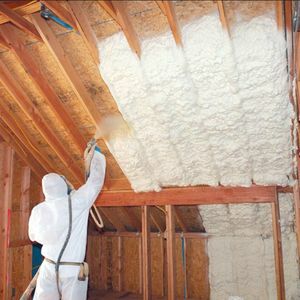 How about sprayed polyurethane foam insulations? The entire house is essentially wrapped in plastic with those applications. Certainly constitiues a greater volume than does the covering on electrical wires or pvc drains. It is promoted as a great solution to energy efficiency, as the best insulation material of all, and is even often promoted as a "green" alternative. Green? Compared to what? does vinyl have a smaller impact??? I was thinking, forget about what the resources are to actually get the wood siding from the forest to the side of your house, What about the maintenance? Lets say you have to paint your house around every 5 years, that’s a lot of toxins going everywhere to accomplish this. Again we have to get paint, which has to be made and shipped from somewhere to your house. Then when you get it there how much of it goes into your lawn, garbage, down the drain, where ever? Not to mention the buckets that the paint comes in, and these days a lot of those buckets are …. You guessed it, plastic! Unless you are buying a 5 gallon bucket, then I guarantee it’s plastic. You have brushes, maybe some of those lovely blue tarps, which are … plastic. Maybe some painters tape to edge, also going into the landfill. It’s a lot of resources, to produce all this stuff, ship it to the retailer then to your house and then to the garbage, the rivers, and or the ground, minus of course that which stays on the side of your house for a few years. There is no way someone can argue there isn’t a measureable impact going on here. The flip side is the vinyl, which probably has a bigger up front impact, but I wonder long term? I have no idea, maybe no one does, but, the only thing you would to do is power wash the siding, that’s just water. And it lasts a very long time. And of course the money you save, we all have a limited amount of resources, you could put it into the side of your house, but buying green and organic always costs more money and wouldn’t it be better spent on the things you buy all the time ( that could provide a smaller impact) then the onetime cost of siding? At the risk of sounding rude, talking PVC here is a lot like arguing abortion at a Christian revival. My 2 cents is that PVC has a viable place in the world. I would prefer to not use it but will use it sparingly. Plastic products can be long lived good tools when used responsibly. Just saying no, not never, ever, smacks of righteous zealotry. The quality of wood and paints are such that I am reluctant to use them anywhere where they are susceptible to weather. I would like to, but I hate to repaint every two or three years. As one who works with foam, I get wound up over the bogus claims of Soy based products being green. A little bit of soy oil mixed into any feedstock for plastic is still plastic and probably yielding a bigger impact on the environment than straight petroleum products. Not burning petroleum is the goal. I suspect we can all agree on that one. No one knows for sure of course how much plastic is left in the planet, but considering that everyone can agree that there is a finite amount -- how would you like to see that finite amount used up? My question has never been whether to use plastic but whether we can afford to waste it. Good topic Martin. I built a house and worked on eliminating PVC. I used ABS drains for plumbing, but then when I bought a refrigerator and washer/drying I noticed all the plastic. I tried to have solid wood furniture and wool rugs. But then often sit and work on my laptop that is mostly plastic and metals. I know in Europe they have a ROHS (Restriction of Hazardous Substances) distinction for laptops that lets you know your laptop is not toxic, but when I went to buy one it was $2,000, a little out of my budget. I used wood windows clad with aluminum, the wood in the last four years has required numerous hours to sand and re-poly, as a result of the dew on the inside frame dripping down to the bottom sash. It seems that each choice comes with it's repercussions and inherent maintenance issues. I think on the next house I built I will use UPVC frame windows, because they are affordable and have much higher performance values then what was available a few years ago. Wood high performance windows seem to be 2 - 3 x the price for the same performance. Although I have opened up to the idea of UPVC window frames, I have a hard time with other PVC products. And there in lies the confusion of building choices in our current times. I think I'd put more focus on keeping water and moisture vapor out of my wall and roof assemblies, then whether or not I have UPVC window frames. Water (harmless until it causes mold on materials) can put construction materials in a landfill very effectively and make a home a moldy uninhabitable toxic box that no one wants to live in. Thanks for your comments. As you point out, it makes little environmental sense to choose wood products over vinyl products if the wood products need to be sanded every few years and refinished with paint or polyurethane. Your house is too humid. And to the broader topic from my perspective working for a municipality where I approves permits and enforce maintenance regulations, the typcial homeowner who enters the replacement window cycle replaces their windows every 5-7 years. The lower the quality of the vinyl window the faster. Higher quality modern windows last about 15-20 years based on our 30 years of records. We also see masonry wall failures at openings where the vinyl windows don't help carry the load of an arched header that was laid up on an original wood window. The PVC vs. Natural products debate is clearer when the subject is new consruction. But when the debate moves to the arena of retrofits vs. reuse of existing materials, the debate gains new variables with several advantages going to reuse. Window replacement is extremely expensive. None of my friends could afford to replace their windows every 5 to 7 years. If you live in a neighborhood where that behavior is the norm, it must be a very high-income neighborhood. Your estimates of window longevity are much too pessimistic. Indeed. I remember a one liner, that a few hundred years in the future, folks will want to say to our generation: "Wait... you had this incredible wealth of hydrocarbons buried in the ground... and you idiots *burned* it?!?!" "the typcial homeowner who enters the replacement window cycle replaces their windows every 5-7 years. The lower the quality of the vinyl window the faster. Higher quality modern windows last about 15-20 years based on our 30 years of records." I have never seen any reputable study showing that vinyl windows last only 5 to 7 years. This is a red herring, in my opinion. "Although it’s hard to predict the service life of today’s vinyl windows, Seiling points out that many people replace windows before they are worn out. “It’s possible that today’s vinyl windows could have a 50-year life,” he says. “But the insulated-glass technology is changing so fast that in 50 years, you’d want to change your glazing anyway.” Paul Adams, director of materials research for vinyl-extrusion company Deceuninck North America, is more conservative with his forecasting. “I think these windows will last 35 years or more,” he says." 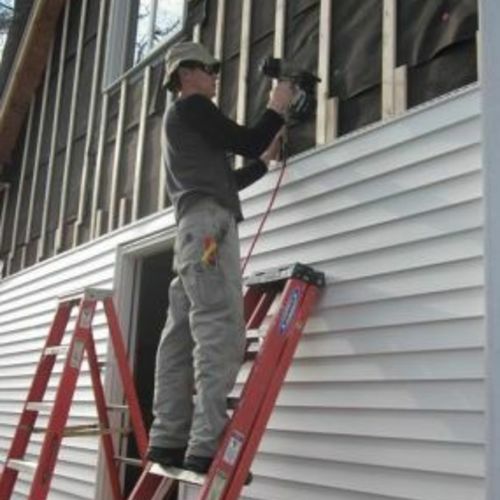 When I was earning extra cash working weekends doing landscaping for my homebuilder employer 16 years ago, he handed me a gas-powered line trimmer and gave me one warning: "Don't hit the vinyl siding with this, or you'll shred it." I swore I'd never use vinyl siding from that day forward. The home I currently reside in has vinyl siding (a prior owner's choice). It has holes in it from the neighbor kids' BB guns (also a previous owner's problem). But every time I see those holes, I am reminded of my vow. One question to supplement the article: Do they hail test vinyl siding? Thanks for being a voice of reason in this rancorous debate. was talking about having to replace the trim on his New Yankee Workshop several times within the span of that program. He shifted over to cellular PVC trim. My sense is that it has a place. My preference is fiber cement trim, but as I and others mentioned earlier,vinyl materials should not be a throw away commodity. They do last. PVC should and can be recycled. 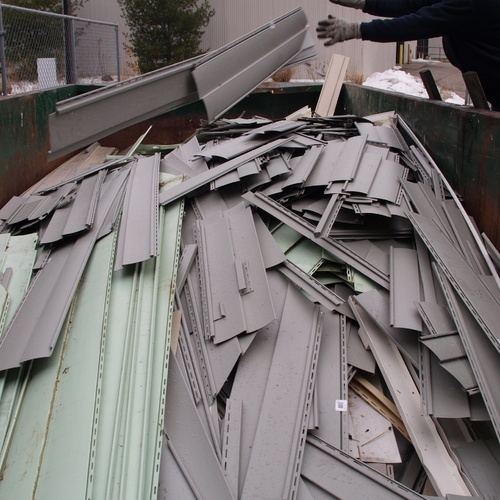 How many times have we seen vinyl siding and cutoffs tossed in the demo dumpster? To be replaced by "green" materials. The whole issue speaks to the industry doing a better job with more environmentally sustainable materials. That should mean an affordable alternative. Not everyone can pay the long dollar to do what feels green. PVC windows albeit ugly and "don't need painting" degrade over time in UV light and become brittle and easily fractured. So they may not need maintenance because you can't maintain them! The UV stabilizers have likely improved over time but what do you do with an old cracked PVC window other than throw it in the landfill. PVC windows might be a cheap alternative (I have used them to my regret) but they are not nor ever can be a "Green Material" no matter how much the industry would like you to believe it. 1) new study just out implicates phthalates with insulin resistance in teens. The stuff isn't even chemically bonded into vinyl, just mixed in and it leaches out. Do you want this stuff in your house? 2) the old joke in the heritage preservation biz about why they are called vinyl replacement windows: because every 15 years you have to replace them. Martin, great concluding statement: "Many of us fret about the environmental effects of our daily decisions, but we tend to focus on issues that don’t matter very much. Meanwhile, we manage to get the big things wrong." It seems that almost anything can be considered "green" under the right circumstances or with the right spin. No criticism of this article, but of the industry in general. The idea that vinyl flooring is green is stretching it. In the articles debating Green/Not Green someone pointed to flooring and said (falsely) that there was no health link. Actually there are a number of studies that link vinyl flooring to health problems to small children. It seems that children crawling on the floor, nose within 6 inches of the floor, are getting major doses of off gassing. Let's get the facts straight before understanding the issues. If there is a scale of green products vinyl would be at the low end. When people know the facts about vinyl windows and expansion contraction, there are much better choices, same with siding. The only reason vinyl is used is to increase profits by using cheap materials. Here's the scoop on phthalates: "Phthalates are used to make vinyl flexible, and are found in sheet vinyl and vinyl composition tile. They are not found in rigid materials such as PVC pipe, window profiles or vinyl siding." You wrote, "The idea that vinyl flooring is green is stretching it." I agree. That's why I wrote, "Almost any type of flooring is a better choice than vinyl flooring." Martin, you seem to be biased against people who have concerns about how much vinyl is used in home construction. You used the terms " Luddite" " zealot" and "crusader " to describe folks who have a different opinion than yours. This does not help your argument. Also, I do not think you offered any answer to the question of hazardous fumes resulting from house fires. My own feeling is that we cannot make this debate all about which product requires the least amount of energy and resources to produce, but rather it should be about when a house finally disintegrates, whether it can be absorbed back into the earth and not leave a mass of plastic debris behind. Even if the vinyl can be recycled, that takes a lot of energy and is not likely to happen in most cases. Lots of esoteric discussion. I just finished building a practical house using vinyl windows. Nobody even mentioned u values or energy performance of the windows. While pricing windows of a u value of about .18, I found no wood framed windows near the cost and performance of my vinyl windows. Wood of a much lesser performane cost more than double my vinyl windows. For those that think these will be ruined in 5 years from the uv rays, how about builing an appropriate overhang into your buildings taking advantage of the natural shading of a properly designed overhang rather than simply what you have done over the last eon. Nobody seems to use simple efficient building techniques like proper overhang because of laziness. Build it better and use affordable efficient products. Just bigger words to attempt to marginalize what was a good article. You are correct in that +80% of the best performing window units on the market today are probably vinyl. The assertion that a vinyl window, even previously UV unprotected, will need to be replaced every 5-7 years is completely baseless. Newer units are comfortably lasting (modeled and observable data over the last 10 years) +20 years. I think Martin was dead on accurate. Its all about how you define "green". When you compare vinyl to some of its other counterparts, the spread is not that far despite the fear mongering on some sides of the argument. I never used the word “zealot.” I did use the word “Luddite” to describe a person who attempts to build a plastic-free house. Since I described myself as a Luddite for years, and since I did my best to build a house with as little plastic as possible, wrestling the materials from the soil and woods around my building site, I was probably thinking of myself when I used the term. In fact, very few anti-PVC activists actually try to build a plastic-free house -- it is difficult -- so I don't think that it's unkind to use the word “Luddite” to describe the very small number of Americans who have attempted that task. In our upscale area of Connecticut we see very little vinyl siding, mostly, I believe, because of aesthetic rather than environmental concerns. But cellular PVC (Azek) trim is all the rage! And as a practical matter, it appears that the durability of PVC trim over wood is hard to deny. On the other hand, I have never specified vinyl windows because of concerns of color fading, loss of plasticizers that may lead to cracking, and a dislike for the crude welded corner joints on one well known brand. However, lately I have gotten over my squeamishness about plastic and have specified fiberglass-clad windows (also hydrocarbon-based) because they seem to overcome what I perceive to be the limitations of vinyl. One manufacturer offers these windows in either fiberglass outside and wood inside, or fiberglass both inside and out, if you prefer the plastic look in your interiors! Shouldn't we install windows to be replaced? This article and the comments raise a side issue with significant environmental impact. Whatever longevity numbers you pick, windows need to be replaced fairly frequently. 30-35 years is periodic maintenance. Yet standard practice is to install windows in a way that makes removal and replacement very expensive, difficult, and likely to destroy most of the components, making reuse/recycling of the materials less likely. I think we could develop window designs and installation methods that would make installing and replacing windows cheaper, easier, and greener, while being more reliable and weather resistant. We have a long way to go, to get there. What products do we want to see? Many of the blogs and comments on this site describe what improvements need to be made, what products need to be developed, and what changes we hope for in the building industry, in order to improve the state of the world. Hearing the suggestions of Martin and others is one of the reasons that I read GBA. Part of the vinyl debate that bothers me is that it often doesn't include possibilities and options that aren't yet on the market. Obviously, someone building today can't choose to use hypothetical future windows, but at the same time, calling for better, greener products in a forum like GBA can be a part of stimulating the market to produce better products. Our choices aren't only between using vinyl and avoiding all plastics. There are differences in health and environmental impact between different types of plastic that are relevant in product choices. Figuring out which products should be made from which plastics is an important part of planning the future. 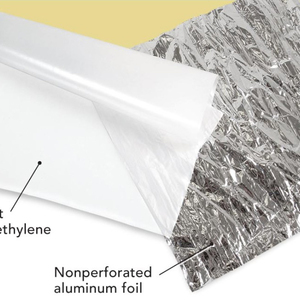 For many years, vinyl advocates said that PVC was the only reasonable choice for electrical insulation, but Apple products, among others, have been PVC free for half a decade. Polypropylene has replaced PVC and polystyrene in many consumer products. Will we see polypropylene windows in the coming years? Would they have advantages over vinyl? You wrote, "Will we see polypropylene windows in the coming years?" I don't know. I do know that a company in Miami, Florida, named Nailite International used to make polypropylene siding. The company is now out of business. According to a comment posted on a web forum, "the siding faded badly." I really enjoyed your article Martin. You and others are the reason I read every email from Green Building Advisor and recommend it to everyone. I winch when I read of 200,000 or more retrofits incredibly expensive green buildings. While I didn't like vinyl around my doors they were the only thing in my basement that survived a 18 inches of water sub pump failure. Tearing out the walls and insulation I developed a love for foam board insulation and used it as a replacement. After looking at problems with condensation with interior storm windows I will use vinyl or fiberglass when I build my retirement home. Besides vinyl floors which I don't want I will also avoid vinyl siding which gets brittle over time, doesn't do well in hail and wasps have shown me they can burrow through. I appreciate the practical advice in the discussions. Vinyl siding is one thing but why use such a remarkably weak material for window frames? It fades and gets brittle and can separate from the building opening. Irrespective of the env impact. Flipside is if triple glaze vinyl costs half that of a better triple glaze window, maybe we should promote vinyl due to the energy savings. Caveat though because vinyl windows likely become increasingly less air tight over time (improperly closing operators and separation from building opening) that loses heating and cooling energy and can cause indoor air quality problems. As a structural material, does it get any worse than PVC? Personally I don't like to risk of dioxin in house fires and landfill fires either. It's the most potent carcinogen on earth. Is there not a less toxic plastic alternative to PVC? It's interesting you mentioned the Prius (a car as a green building professional I cannot afford to buy) then said stop consuming. I realized way back that living in a small apartment and using transit is way more ecological than living in a green detached house and driving a prius. I'm not so sure about saying "let's face it plastic is all around us anyway so let's just accept it". Genocide and slavery are also all around us ... Notable that there is more slavery today than at any time in history - according to Wikipedia anyway! The structural weakness of vinyl is not an impediment to using vinyl for window frames. Engineering and design have risen to the challenge. With adequate lineal thickness, and sometimes steel reinforcing, vinyl windows meet the engineering specs that window designers require. Aluminum is much stronger, of course, but aluminum is a thermal disaster. There are trade-offs with all materials. My comment about environmentalists who lust after a Prius while disdaining vinyl windows was intended to highlight the hypocrisy (or at least the inconsistencies) of such a position. I was not advocating Prius lust. still there is a problem with high expansion/contraction, fading and brittleness and production of dioxins during the lifecycle. Plus not all vinyl windows are made as strong as they should be. A zero tolerance policy on dioxins, to my mind, is not at all a crazy idea considering it accumulates forever in our habitat and bodies and is the most potent carcinogen on earth. That alone could be the overwhelming issue with PVC. Heck why not shoot for no dioxin ... is that a radical idea? I agree that it makes sense to reduce dioxin releases into the environment. However, vinyl siding and vinyl window production don't appear to be responsible for significant dioxin releases. According to one document, "Dioxin emissions and levels in the environment are declining, according to data from the U.S. Environmental Protection Agency (EPA). Dioxin emissions from human sources in particular have declined by more than 90% in recent decades, and further declines continue to be documented. This has occurred even as production of vinyl has soared, proving that vinyl production and disposal are not significant contributors to dioxin levels, accounting for less than 1% of total dioxin releases to the environment. This simple fact indicates that there is no significant relationship between vinyl use and aggregate dioxin releases to the environment." You're right that some vinyl windows are flimsy. But so are some wood windows. Clearly, it makes sense to buy well-built windows, not flimsy windows, whether the window frames are made of wood or vinyl. Thanks for the excellent info - excellent news on dioxins - and cheers to triple glazed windows! Someone mentioned the P word related to Vinyl windows. Are there Phthalates in vinyl windows? Phthalates are used as a plasticizer to make rigid PVC flexible. I do know that companies who have used Phthalates are moving away from them, for obvious reasons and are using other plastics like urethanes in lieu of these toxic materials to make rigid PVC flexible. A side bar to this issue, I found a study years ago that tested the toxicity of different materials, natural and man made in fires. Of course, things like foam and upholstery can burn readily, given their low density, but it turned out that the natural materials were more toxic. Granted this was in a fire scenario, and I would rather lounge with a cotton fabric rather than flexible PVC. We need to have an informed view of how and where we use the tools (materials) at our disposal. You're assumption that window replacement is expensive and therefore only a problem in high-income neighborhoods is fundamentally wrong. Lower and middle class home owners (i.e. the mass market) who can't afford the best windows install the $199 specials when they absolutely have to. These are the cheapest worst constructed windows on the market, usually with poor joint construction and weak balances. Not only are these cheap windows usually installed incorrectly, they mechically fail after 5-7 years of opening and closing. Think of it as the Wal-Mart Effect. This affects lower income households mostly. They can only afford $199 windows, so that's what they buy. They also don't have time to research to find the best window manufacturer. The cheapest route is also the quickest when window purchases are based on the Sunday circular and t.v. commercials. Then it's typical for the failed window to stay in the opening well beyond their failure until another window replacement can be afforded. Upper incomes skip right to the top of the line windows, might even have an architect or high-end green builder working for them, and get better quality from their up front investment and enjoy 20+ years of performance. But these consumers are the smallest minority in the market. I agree with you completely that upper-income homeowners can afford to install more expensive windows than low-income homeowners. That much is obvious. You are apparently disagreeing with my challenge to your statement that "the typical homeowner who enters the replacement window cycle replaces their windows every 5-7 years." First of all, there is absolutely no evidence to support your statement. Second, the window-replacement salesmen who advertise $199 specials are notorious bait-and-switch artists. The usual result of their sales tactics is a contract for significantly more money than $199 per window. To replace all of the windows in even a small house can easily cost $5,000, and it is far more common to hear of window replacement jobs that cost $10,000 to $15,000. It's simply not true that low-income homeowners are spending this kind of money every 5 to 7 years. I live in a low-income region of Vermont, so I know what I'm talking about. Our office has a 30 year, 50,000 record database that says otherwise. In addition, our maintenance inspector has a long list of properties where instead of replacing failed/inoperable vinyl windows owners just live with that condition because, as you've expressed, they just don't have money to buy windows again. We see permits for high-end windows approximately 20 times a year. We see permits for low-end windows approximately 200 times a year. That's just the way it is in our city. It seems that your records show that more inexpensive windows than expensive windows are sold in your city. That's not too surprising. If you have any data on window longevity, please post a link here, or send it to my attention by e-mail: martin [at] greenbuildingadvisor [dot] com. The discussion on the long term environmental impact of vinyl windows is very valuable. What I am missing is the fact that just like in the category "wood window" there are many different products that allow for differentiated conclusions. For example, true there are "cheap" vinyl windows, and also true, they might degrade faster because of the raw material used. However there are more expensive vinyl windows (maybe even more than wood windows) as well with long lasting laminated finishes. These windows will not deteriorate under UV exposure for decades. Salt air environments pose a whole new set of challenges to windows. Again, the vinyl window outperforms most other raw materials because salt does not affect PVC whatsoever. So, PVC windows certainly have applications in coastal environments that meet most expectations for green building. MArtin, you have been excellent in responding to all of rthe questions except I have not seen any comments with respect to the potential fire hazard risks that come from PVC windows. We work on multi-residential housing projects where buildings can go as high as 12 stories or even more. DO you have any comment on the risk associated with uPVC and the potential spread of the fire (and toxic fumes) from the outside to a residential unit above ? Once again it is hard to decipher how much this risk should be weighed upon when looking at affordable triple glazing for multi-residential buildings. I don't believe that there is any evidence that vinyl windows are at risk of ignition. After all, wood windows can catch fire. The question is: once your building is on fire, is the smoke from burning vinyl windows worse than wood smoke? The answer, as far as I know, is yes. This is chiefly a matter of concern for firefighters, however. If your building is on fire, and the apartment below yours is fully engaged, you're at risk. What you want is to pray this never happens. Fortunately, such catastrophic fires are rare. If you're worried about this risk, choose a building with sprinklers and with two modes of egress (two stairways). Don't choose an older building with no sprinklers and with only one stairway. Once the building is on fire, you have a lot of things to worry about. Whether or not the window is made of vinyl will be the least of your worries. You have your “typical” cheap vinyl windows that degrade, warp, and have to be replaced within 5-7 years (especially in the desert SW). These are your typical “builder grade” vinyl windows that they install in most spec homes. These types of windows are both energy inefficient and carry a heavy embodied energy penalty with them because they have to be replaced and produce landfill waste, basically every 5-7 years. Of course those types of vinyl windows will never be “green” because they have to be replaced so often. If one does some research they will find that there are better-engineered vinyl or PVC windows out there that are made to last 30+ years. For instance, Intus Windows uses Inoutic frame profiles that are unplasticized PVC, or uPVC, which makes the window frames much more stable and prevents UV damage. They also utilize stabilizers and titanium dioxide in their frame profiles to protect the PVC framing which makes the windows last a very long time. The Intus uPVC frames have been tested to withstand 180F without deflection. They have really taken PVC to the next level. By creating a uPVC window that can take a beating from the sun and elements, it can be in use for 30+ years without having to be replaced like the cheaper vinyl windows out there. This creates less waste and longer life cycles. This is a win-win scenario for both the homeowner and for the planet since the vinyl windows are not being replaced every 5-7 years. All vinyl windows, not just Intus windows, use unplasticized PVC. All vinyl windows, not just Intus windows, use vinyl that contains titanium dioxide. The idea that some vinyl windows need to be replaced every 5 to 7 years is a red herring. I have never seen any reputable study that shows such a short lifetime for a vinyl window. No homeowner could afford the expense of swapping windows on a 5 year schedule. You are correct, of course, that some vinyl window manufacturers make a higher quality window, and some make a lower quality window. The difference has nothing to do with plasticizers and titanium dioxide, however. Better vinyl windows will have heavier vinyl lineals that are physically stronger; they will have better weatherstripping and better hardware; and they will have better glazing. Thanks for sharing your experience with Milgard vinyl windows. We all gain from sharing such stories. If the windows have a lifetime guarantee, I urge you to continue insisting that the manufacturer honor the warranty. As I have written before, there are plenty of low-quality vinyl windows out there, and they should be avoided. There are also plenty of low-quality wooden windows out there -- I have some on my house -- and plenty of low-quality aluminum windows. It's always worth investing in quality building materials. By sharing our stories, we can all learn which manufacturers are producing quality products, and which manufacturers to avoid. The current home I reside in was built in 2006 and it was built like any other of the countless hundreds of spec homes in the area by the builder. The windows are from Milgard vinyl window manufacturer and they install these windows in all the homes. To date, I had to replace 6 windows within the first 3-5 years and since then 2 more have failed, bringing the total to 8 windows failing within 7 years. The vinyl has warped and bowed out, breaking the silicone seals on the windows, causing the glazing to leak when it rains. Not to mention the exterior vinyl has degraded to the point that it fell apart when touched. I am not alone in my window woes. Many of the homeowners have the same problem, especially on the south and west facing windows. The north facing are holding up better but the others are failing. My sliders have twisted to the point that opening them up is difficult and it's because the vinyl frames were so cheaply made that they twisted, bowed and the sun disintegrated the vinyl frames. I was told the "chaulking" was caused by poorly made vinyl/pvc, as was the rest of the problems I experienced. I've had PVC pipes sit in the blazing desert sun for years and never bow, twist, or disintegrate. I agree, no homeowner could afford replacing the windows every 5-7 years and I had to twist the arm of the manufacturer to get them to step-up with their warranty claims and replace them, which they did originally but no longer want to. That is the problem with warranties, once the manufacturer doesn't play ball, these "lifetime warranties" are useless. The window manufacturer is Milgard Windows, and they are the "Vinyl-Classic" series. They installed these windows in all the new homes out here (2003-2010). Milgard had a production plant out here in Arizona but they shut it down due to the economy back in 2010/2011. They have also cut back on their warranty service as part of their financial restructuring. Like I mentioned before, these "lifetime warranties" are useless because as soon as the window manufacturer doesn't feel like replacing them, they don't, and you are stuck with paying the bill. It doesn't matter who the manufacturer is, they all do it. It's been a frustrating ordeal replacing windows that are a few years old. They had to use some low grade vinyl because the stuff literally fell apart after a few years. They seal the glass to the vinyl frame using double sided tape and silicone caulk. That lasts for about 12 months before the tape fails and the caulk bead breaks due to the expansion rates and cheap vinyl frames. Then the windows leak each time it rains. The final insult is that they installed windows with U-Values of 0.36 - 0.41 and SHGC of 0.35 - 0.45 on the southern and western exposures. Nothing like baking a home with high SHGC windows out in the Phoenix desert. It makes the electric company happy when these homeowners are paying a $500 a month utility bill during summer to cool the home. I responded to some of the issues you raised in my Comment #50 (which I updated after you updated your Comment #49). I certainly agree that windows in Phoenix can easily contribute to overheating unless they have glazing with a very low SHGC or unless they are shaded by wide roof overhangs or porch roofs. I have always advised readers of GBA to pay close attention to glazing specs before selecting windows. I'm sorry to hear about your bad experience with Milgard Windows. As I wrote earlier, if these windows have a lifetime guarantee, I urge you to continue insisting that the manufacturer honor the warranty. Can Vinyl Siding be Applied Over Furring Strips?